Our small jar of Premium Raw Organic Virgin Coconut Butter is not enough for you? That is perfectly understandable! By buying the one-liter-jar you can make your whole family happy and save a whole lot of money, too. So good, so tasty, so worth your money thats our non-processed, guilt-free Coconut Butter. Are you a vegan or vegetarian? Then you simply have to try our strictly vegan Butter; its perfect for your lifestyle. Are you lactose intolerant or do you have a gluten intolerance? Then you will love this fresh Butter made from only the best coconuts. Fair Trade and organic and sustainable cultivation matter to you? Our Coconut Butter is exclusively produced by certified organic farmers for fair wages. In short: everybody benefits from this coconut product! Organic Coconut Butter pure coconut flesh for the real taste of coconut Made from luscious and harvest-fresh coconut flesh, our coconut butter in raw food quality is processed within a maximum of 72 hours of harvesting. It is unsurpassed in flavor and creaminess. It instantly melts on your tongue, offers a delicious taste, contains all vital substances of the coconut and is versatile in use. Since our coconut butter is raw, it has many fans among raw food enthusiasts, vegans and all those who put an emphasis on a conscious nutrition. Even people with food intolerances can indulge in Dr. Goerg Premium Raw Organic Coconut Butter. By now it is common knowledge that coconut is perfectly suited for a healthy and active lifestyle due to its high nutritional value. 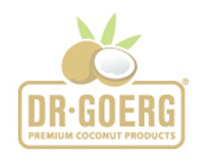 It goes without question that all Dr. Goerg products are 100 % all-natural. We dont give additives like thickening or bleaching agents and emulsifiers a chance. After all, we want you to enjoy the real and pure taste of coconut! Coconut butter becomes easy to spread at roughly 24 °C therefore it makes sense to gently heat it in a warm water bath or position it close to a radiator. Even small amounts of coconut butter provide a maximum of flavor! For frying we recommend using Dr. Goerg Premium Raw Organic Virgin Coconut Oil since coconut butter is not as heat resistant. Apart from this there are no restrictions to the usage of coconut butter simply add it to taste! Dr. Goerg Organic Coconut Butter has a shelf life of up to two years. Store the coconut butter closed at room temperature and avoid direct sunlight. Below 24 °C the butter solidifies. This does not affect the quality in a negative way. It can be liquefied in a warm water bath without a reduction in quality. Ich verwende das Biokokosmus im "weißen Smoothie" und auch als Zutat zu Suppen oder Soßen. Das eher selten, da es mir um die rohe Verwendung geht. Dr. *** Kokosmus ist von allen Produkten, die ich ausprobiert habe, das homogenste. Das Kokosnuß esse ich entweder pur oder als Brotaufstrich. Am Anfang muss man es kurz warm machen und umrühren, da sich das Kokosöl oben absetzt. Sehr zu empfehlen! Ich nehme das Kokosmus pur. Es schmeckt super und ich empfehle es allen die Kokosöl nicht so gerne essen. Es schmeckt leicht süß, so dass man keinen Heißhunger auf andere Süßigkeiten hat. Der gesundheitliche Aspekt ist mir natürlich auch sehr wichtig. Das Kokosmus kann ich absolut empfehlen.